Arms of William Alexander, 1st Earl of Stirling: Quarterly: 1st & 4th: Per pale argent and sable a chevron and a crescent in base counterchanged (Alexander of Menstrie); 2nd & 3rd: Or, a lymphad sable between three crosses crosslet bottony fitchée gules 2&1. (Stirling). In the point of honour an escutcheon argent, a cross saltire azure charged with an escutcheon of the arms of Scotland. 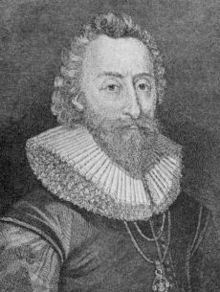 William Alexander, 1st Earl of Stirling (c. 1567 in Menstrie, Clackmannanshire – 12 February 1640) was a Scottish courtier and poet who was involved in the Scottish colonisation of Habitation at Port-Royal, Nova Scotia and Long Island, New York. His literary works include Aurora (1604), The Monarchick Tragedies (1604) and Doomes-Day (1614, 1637). William Alexander was the son of Alexander of Menstrie and Marion, daughter of an Allan Couttie. As a young man, William became tutor to the Earl of Argyll and accompanied him abroad. At a later date he received the place of Gentleman Usher to Prince Charles, son of James I of England (James VI of Scotland), and continued in favour at court after Prince Charles became Charles I of England in 1625. He built a reputation as a poet and writer of rhymed tragedies, and assisted King James I and VI in preparing the metrical version known as "The Psalms of King David, translated by King James" and published by authority of Charles I. James knighted him in 1609 and appointed him the Master of Requests for Scotland in 1614, effectively his private secretary. In 1615 he was made a member of the Scottish Privy Council. Nova Scotia plaque on the esplanade of Edinburgh Castle. In 1621, King James I granted William a royal charter appointing him mayor of a vast territory which was enlarged into a lordship and barony of Nova Scotia (New Scotland); the area now known as Nova Scotia, New Brunswick, and part of the northern United States. The creation of Baronets of Nova Scotia was used to settle the plantation of the new province. He was appointed Secretary for Scotland in 1626 and held that office for the rest of his life. Lord Stirling's efforts at colonisation were less successful, at least in monetary terms. He briefly established a Scottish settlement at Port Royal, Nova Scotia, led by his son William Alexander (the younger). However the effort cost him most of his fortune, and when the region—now Canada's three Maritime Provinces and the state of Maine—was returned to France in 1632, it was lost. He spent his later years with limited means, and died in London on 12 September 1640. However Alexander's settlement provided the basis for British claims to Nova Scotia and his baronets provided the Coat of arms of Nova Scotia and Flag of Nova Scotia which are still in use today. In 1630, King Charles rewarded his service by creating him Lord Alexander of Tullibody and Viscount of Stirling. Three years later, when Charles was crowned in Holyrood, in 1633 he became Earl of Stirling and Viscount Canada. On 22 April 1636, Charles told the Plymouth Colony, which had laid claim to Long Island but had not settled it, to give the island to Alexander. Through his agent James Farret (who personally received Shelter Island and Robins Island), Alexander in turn sold most of the eastern island to the New Haven Colony and Connecticut Colony. Farret arrived in New Amsterdam in 1637 to present his claim of English sovereignty but was arrested and sent to prison in Holland where he escaped. English colonists attempted to settle at Cow Bay at what today is Port Washington, New York in 1640, but were arrested and released after saying they were mistaken about the title. After 1640, eastern Long Island was quickly settled by the English while the western portion remained under Dutch rule until 1674. Alexander died on 12 February 1640 and was succeeded by his grandson William Alexander, 2nd Earl of Stirling (c.1632- May 1640), a child who himself died the same year. The 3rd Earl, Henry Alexander (d. 1650), was the second son of William Alexander, the 1st Earl. Alexander was one of the most highly regarded Scottish poets in early seventeenth-century Scotland and England: he was praised by William Drummond of Hawthornden, Arthur Johnstone, Andrew Ramsey, Michael Drayton, Samuel Daniel and John Davies of Hereford. Alexander's earliest work was probably Aurora (London, 1604), which was described on its title-page as 'the first fancies of the author's youth' and is a late addition to the corpus of Elizabethan Petrarchan sonnets. His closet dramas - Croesus, Darius, The Alexandrean, and Julius Caesar - were published together as The Monarchick Tragedies (London, 1604; further editions in 1607, 1616, 1637). According to Daniel Cadman, in these plays Alexander 'interrogates the value of republican forms of government and provides a voice for the frustrations of politically marginalised subjects of absolutist regimes'. Alexander's grandest work is an epic poem describing the end of the world, Doomes-day. It was first published in four books (Edinburgh, 1614), and later in twelve (in the collected edition of Alexander's work printed in London, 1637). The poem, which contains almost 1,400 eight-line stanzas in total, begins with a synopsis of world history in the First 'Hour', then provides long catalogues of the creatures, battle dead, pagans, monarchs, sinners, biblical characters and, finally, members of the heavenly host who will appear at the Final Judgement. Alexander's method was indebted to the French Protestant poet Guillaume de Salluste Du Bartas; Drummond acknowledged the kinship in the title of a manuscript poem 'Sur les oeuures poetiques de Guillaume Alexandre, Sieur De Menstre'. This passage speaks of the value that Alexander placed on his literary pursuits (which mostly took place at his Menstrie estate) as an activity that was separate from but complementary to his public life as a politician and colonizer. Indeed, the phrase 'recreate myself with the Muses' re-appeared in the title of the collected edition of his works, Recreations with the Muses (1637). The Canadian Coast Guard has named the CCGS Sir William Alexander in his honour. ^ Grosart, Alexander Balloch (1885). "Alexander, William (1567?-1640)" . In Stephen, Leslie (ed.). Dictionary of National Biography. 01. London: Smith, Elder & Co. p. 275. ^ "Nova Scotia". Patrimoine canadien / Canadian Heritage. Retrieved 2 December 2008. ^ "NOTES AND COMMENTS - Canada and the Peerage". Volume XLV (13843). New Zealand Herald. 1 September 1908. Retrieved 22 July 2017. ^ Reid, David. "'Alexander, William, first earl of Stirling (1577–1640)',". Oxford Dictionary of National Biography. Retrieved 5 November 2014. ^ Chambers, E. K. The Elizabethan Stage. 4 Volumes, Oxford, Clarendon Press, 1923; Vol. 3, pp. 208-9. ^ Cadman, Daniel. "'"A fit Physitian for an aguish State": Sovereignty, Republicanism, and Stoicism in William Alexander's Monarchicke Tragedies' [abstract]". academia.edu. Retrieved 5 November 2014. ^ Auger, Peter (2010). "Recreation and William Alexander's Doomes-day (1637)". Scottish Literary Review. 2 (2): 1–21. ^ "William Drummond of Hawthornden (1585–1649)". Catalogue of English Literary Manuscripts. Retrieved 5 November 2014. ^ Alexander, Gavin (2004). Sidney's 'The Defence of Poesy' and Selected Renaissance Literary Criticism. Penguin. p. lxxvi-lxxvii. ISBN 978-0-141-43938-9. ^ McGrail, Thomas (1940). Sir William Alexander, First Earl of Stirling: A Biographical Study. p. e.g. 71. Chambers, Robert; Thomson, Thomas Napier (1857). "Alexander, William" . A Biographical Dictionary of Eminent Scotsmen. 1. Glasgow: Blackie and Son. pp. 42–46 – via Wikisource. Nigel Tranter, Poetic Justice, London: Hodder & Stoughton, 1996. A well-researched & lively retelling of the life of William Alexander, 1st Earl of Stirling. Chisholm, Hugh, ed. (1911). "Stirling, William Alexander (Poet)" . Encyclopædia Britannica (11th ed.). Cambridge University Press. Harvey, D. C. (1979) . "Alexander, William, Earl of Stirling". In Brown, George Williams (ed.). Dictionary of Canadian Biography. I (1000–1700) (online ed.). University of Toronto Press. Wilson, J. G.; Fiske, J., eds. (1900). "Alexander, Sir William" . Appletons' Cyclopædia of American Biography. New York: D. Appleton. This page was last edited on 28 March 2019, at 17:44 (UTC).